Is Throckmorton P. Gildersleeve (Harold Peary), Summerfield's most notorious "bachelor on the prowl," about to adopt a third child? That's how it seems when he finds an abandoned baby girl in the backseat of his car. Informed that the child could be taken away from him because of his bachelor status, The Great Man proposes to Adeline�and her cousin�Gildy's old flame, Leila Ransom! How will this ticklish situation work itself out? What will become of the baby? 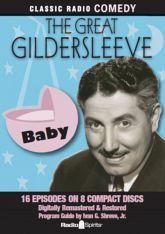 Who will win the sponsor's "Name The Great Gildersleeve Mystery Baby" contest? And, what will the winning name be? Find out in these 16 digitally restored and remastered episodes! Includes Program Guide by Ivan G. Shreve, Jr.